Delight in the wrong thing leads to brokenness – a broken world, broken relationships, broken dreams. And my eyes seem to forever roam for something more, different. It as if I get too comfortable with God, the creator of the universe, who loved me so much He suffered for me, paid the price for my sin, and is preparing a place for me in eternity. He is the God who has plans for me this side of heaven too. Plans that matter for eternity, meaning I am significant. Even though I know that He loves me and has perfect plans for me I become dissatisfied. He is too slow in fulfilling a dream. Does He even see me? He didn’t answer my prayer the way I wanted Him to, so I feel hurt and distance myself from Him. I start looking for something else to delight my eyes. Something I believe will fill me. Shout for joy, be glad. 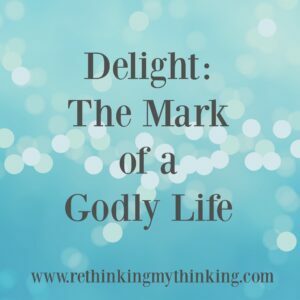 God wants us to delight in Him. He wants us to be joyful and glad in His goodness, His love, His justice. When we delight ourselves in God we recognize that He delights in caring for us. This means we can trust Him when He answers our prayers with a “no” or a “not yet.” We can delight in His sovereignty, His love, His saving grace. How do we make this choice to delight in God and go looking for satisfaction outside of God? We learn to store up God’s Word in our hearts that we may not sin against Him. Far too often we look at spending time in God’s Word as drudgery. We forget that it is a love letter from God. We fail to see that His Word is what helps us know His character. Doing His Word is our delight because of what He has done for us. Father God I confess that too often I look for delight and fulfillment in things outside of You and Your will. I chase delight in dreams, hopes, people, circumstances rather than delighting in You. Help me to long for Your Word that I may learn to delight in You alone. May all other things I am tempted to delight in above you pale in comparison to the delights You have to offer me. May I delight in You so that I may not sin against You. Thank You for loving me even in my fickleness. In Jesus’ Name I pray, Amen.